Gudovac-Gradina is a lowland mediaeval earthen fortification situated in the northern part of the village of Gudovac, around 7 km south-west of Bjelovar. The fortification was erected in a swampy and waterlogged environment, around 50 m west of the Plavnica brook. The central elevation is fortified by a wide ditch and bank, which is best preserved in the north. Further, the entire surrounding space contains a complex of banks and ditches, which functioned as the defence of the fortification and were used as a means of communication with a smaller earthen fortification separated by a 500 m distance – Mala Gradina (which was probably used as a sentry). 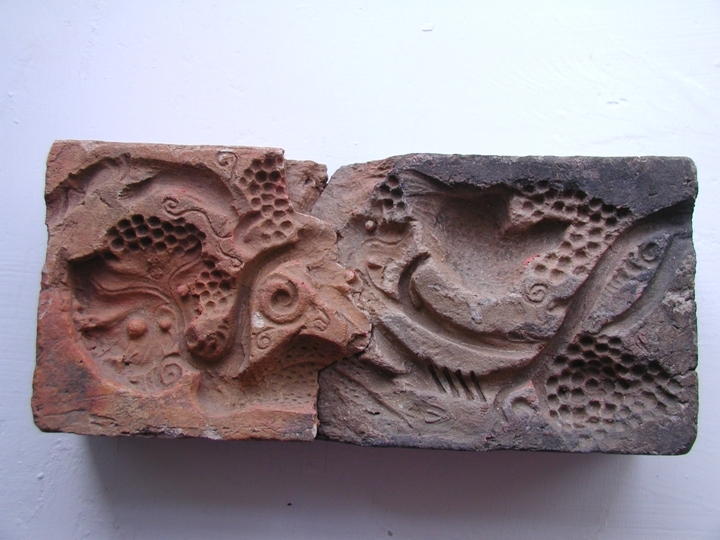 The fortification in Gudovac yielded moulds and tiles for luxurious tile stoves of the kind produced at the royal court in Budapest at the end of the 15th century. 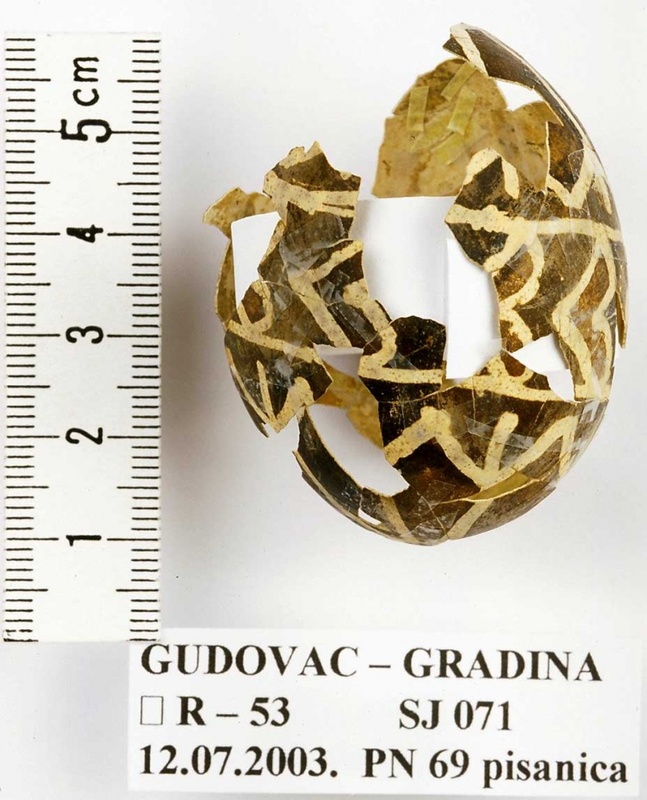 The finds of decorative faience plaques and glass cups substantiate the status of the nobles – owners of the Gudovac fortification. 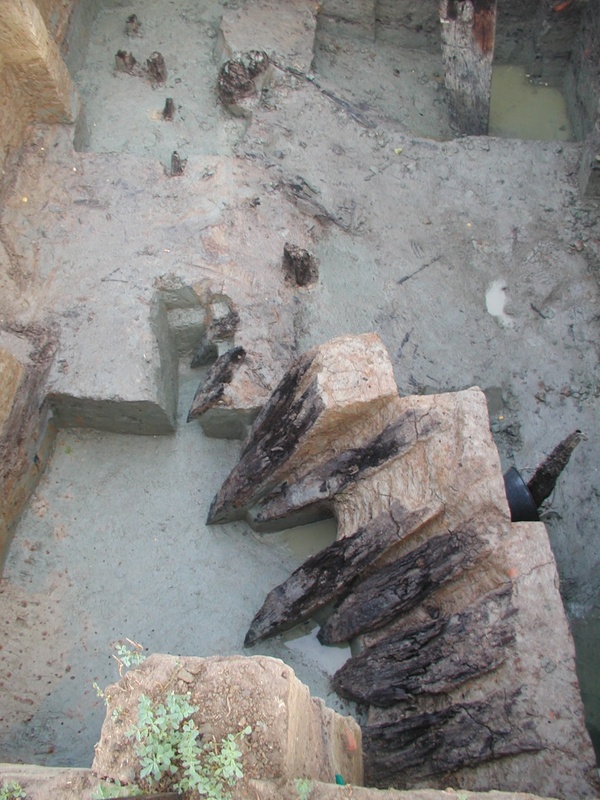 The investigations covered a part of the moat and the slope of the central elevation, uncovering the well-preserved remains of a collapsed structure or another timber building – dressed oak planks and beams, and beech poles and stakes. The wealth and character of the finds from the ditch (storage and cooking pots, iron knives, ladles, pan, chicken and duck eggs, huge quantity of animal bones etc.) point to the function of the collapsed room. Owing to the wetness of the soil, pieces of leather from clothing items, leather shoes, pieces of linen fabric have remained preserved. We also found pits of peach, sour and sweet cherry, walnut and hazelnut, as well as the remains of cereals (millet? ), gourd etc. The base of the ditch was reached at the depth of 3.80 beneath the present-day surface. 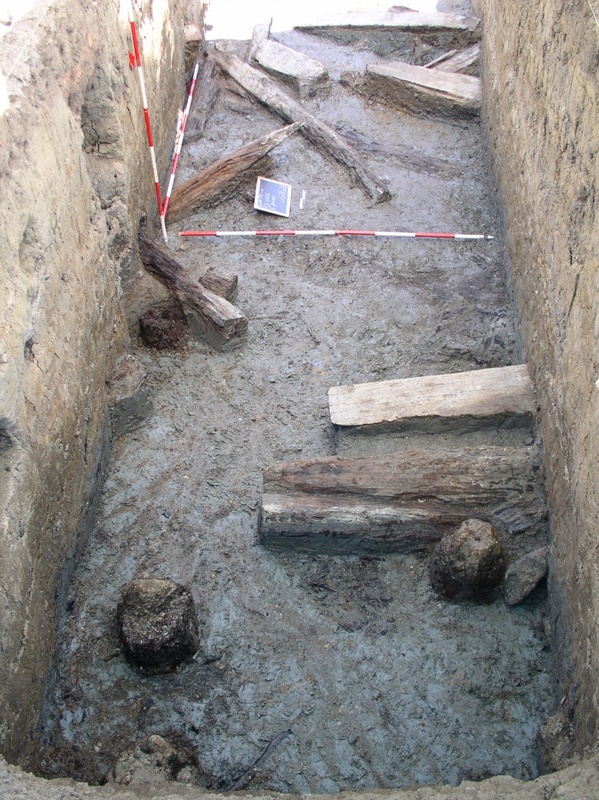 Adjacent to the slope of the central elevation, the excavation uncovered a semicircular row of wooden beams. The beams were set vertically into the soil beneath the structure of the bridge. The beams surrounding the central elevation, without any connection with the bridge structure, were set at an angle (their lower end was dug into the slope of the central elevation). It is supposed that they had pointed tops, which were used as an additional defence of the central elevation, while at the same time reinforcing its slope. 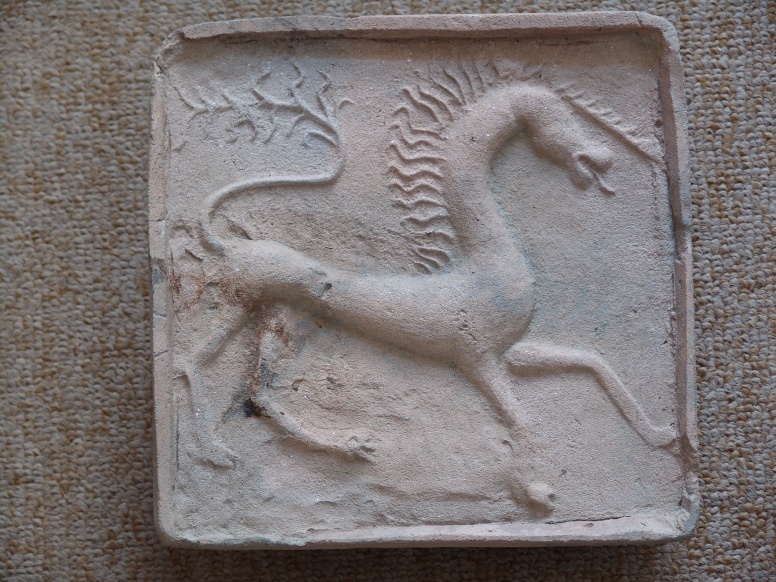 The archaeological investigations have shown that in the Late Middle Ages the Gradina in Gudovac was a fortified manor (majur), where, in addition to the complex coexistence of the feudal lord and the people serving him, there was also an active workshop production of tile stoves. 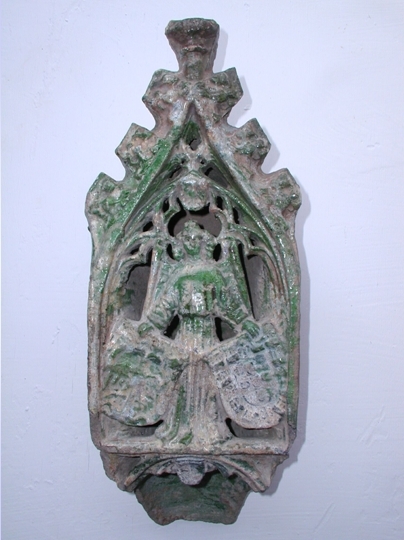 This position was inhabited from prehistory (a Neolithic layer), probably through Antiquity (certain finds within mediaeval layers) to the Middle Ages. Historical sources point to the possibility that the fortification was erected at the beginning of the 14th century, when one magister Gud was mentioned (after whom the village was named). The life in the fortification peaked in the latter half of the 15th and the beginning of the 16th century during magister Petar, a viceprothonotary of the Kingdom of Slavonia and the manager of the estate of the Zagreb Diocese, who had close ties not only with the Church, but also with the Royal Court in Buda. Around 1543, the fortification changed its function as the seat of gentry, becoming one of a number of fortifications in the system of defence against the Turks. The earthen fortification probably collapsed around the mid-16th century, when it ceased to be mentioned in historical sources.